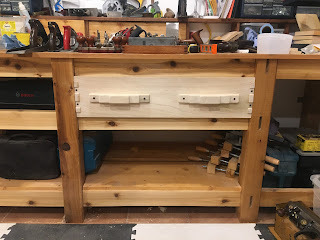 The Off-grid Wood Butcher: Workbench drawers - Finally! Finally, after the power outage adventure, I am back to my drawer with the hope to put it behind and move onto my next project. After having cut and rabbeted most of the bottom boards (see my previous post) I need to do the same with the last boards after having cut them to correct depth. 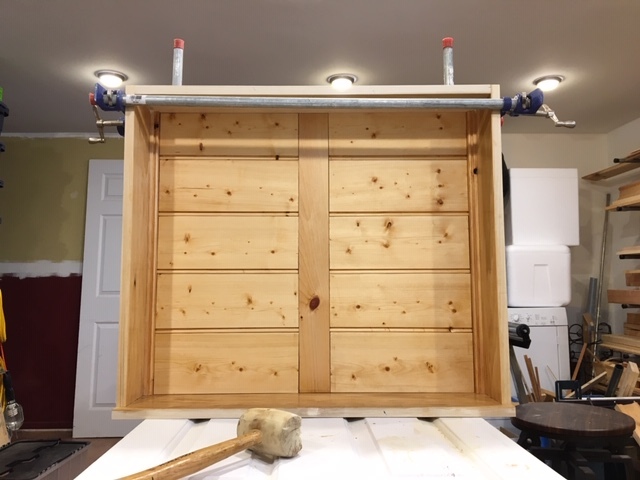 I did a quick dry fit to ensure that the drawer bottom was well inserting in the grove cut on back board. 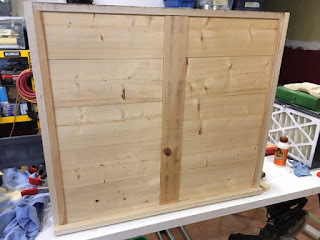 Next I cut a bead on each bottom board to make a nicer join. This time instead of using my venerable wooden plane I used my Stanley 45 combination plane to cut the beads. I never tried the Stanley 45 for beading yet so it was the perfect occasion. I fitted a 3/8 beading iron that I set to cut thin shavings. The Stanley 45 manual specify to use the beading gauge but in my case it was not possible or I would not have been able to plane to the correct depth. I removed the left skate and attached the fence so it rides on the edge of the board. Something I learned is that for the cut to be smooth and easy, I really need to set the blade to a very thin shaving. When each side of the blade start to bite in the wood everything goes easily but while going deeper, as the blade will progressively cut on all its width, the cut becomes also more difficult so making more frequent pass with thinner shaving makes the cut easier and smoother. When all beads were done I reassembled the drawer. ...looking from another angle to be sure. 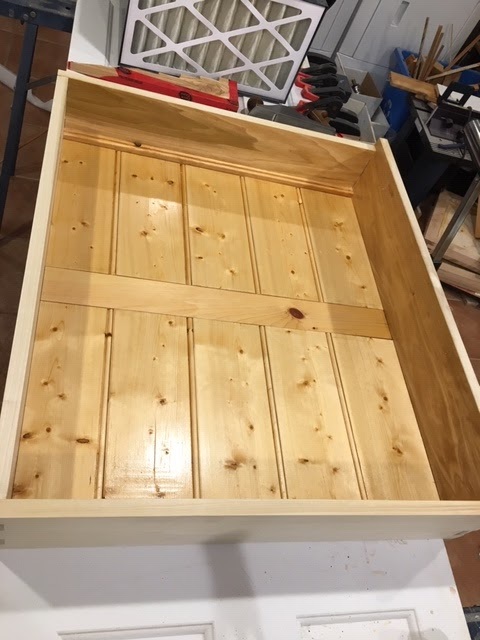 I applied a coat of 50/50 mix of boiled linseed oil and turpentine to the drawer interior, left it to dry overnight and then applied 3 coats of blonde shellac. I left the shellac to dry for half a day and made the final assembly by gluing the back board. After few hours the glue was dry enough to check the final result. ... stepping back to admire the work! It is not perfect but I am pretty satisfied for a first try that will reside in my workshop. 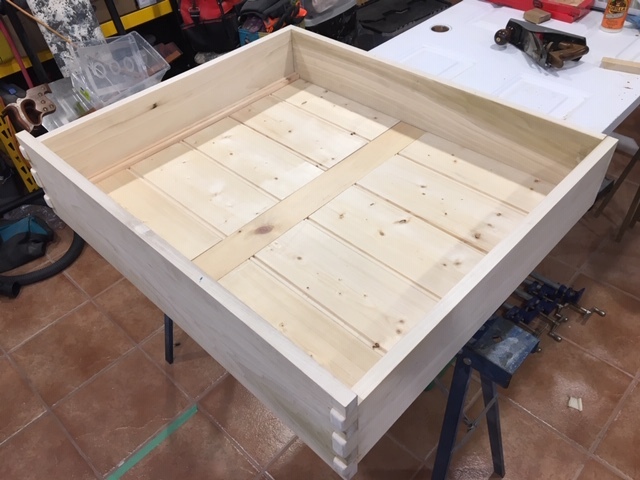 To finalize the drawer I need to install the handles and add dowels to the box joins. As I do not have ebony to make these dowels I used what I have handy and dipped the dowels in dark gel stain. 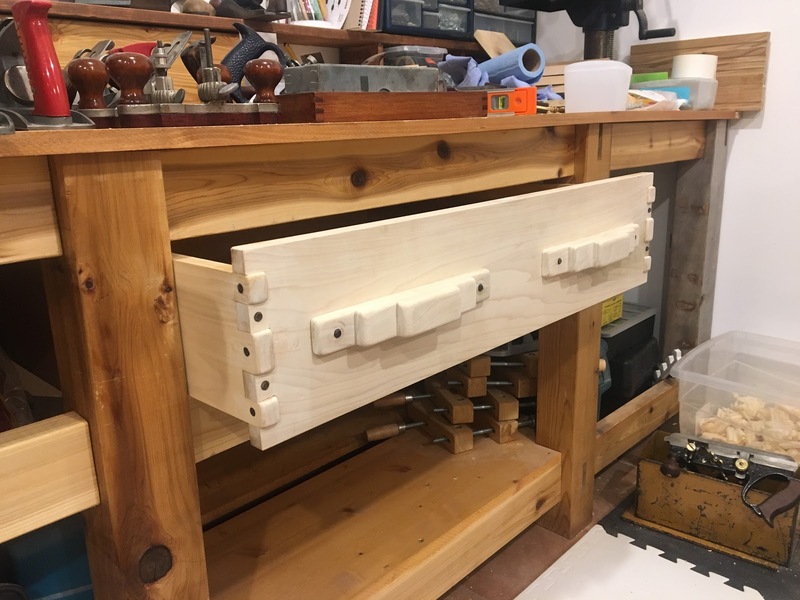 These dowels are more for the look than for the strength as the joins are already glued and solid enough for this drawer. I used my hand brace to bore 5/16" holes in the join tenons and set the dowels. 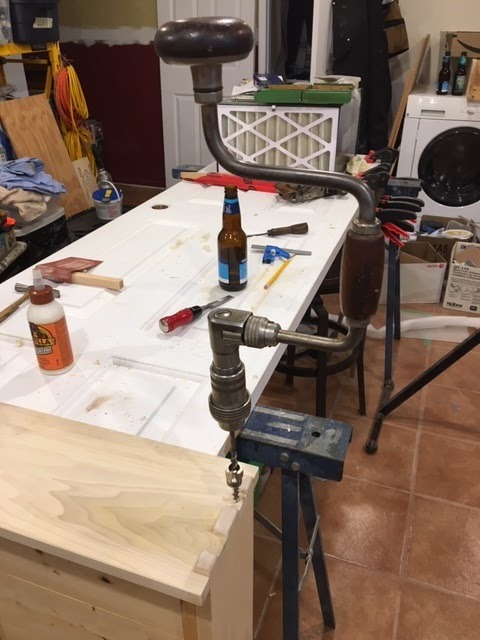 Boring holes for the dowels with my hand brace. 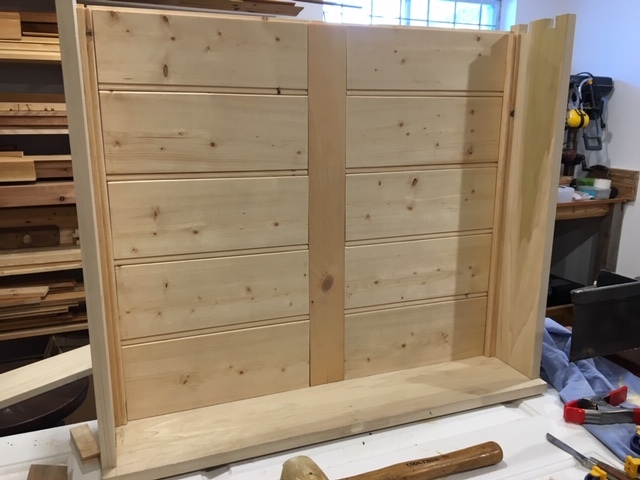 After having set the first dowel I took a step back to have a look, well I like it! 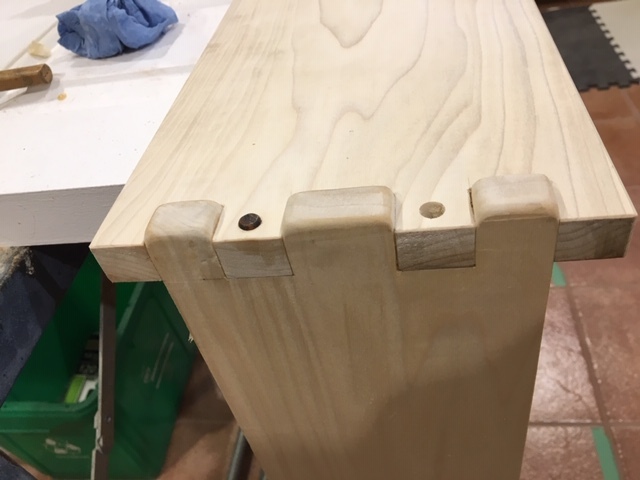 I know that these are not square dowels like for the traditional design from Greene & Greene, but like said before this is just an inspiration to me. 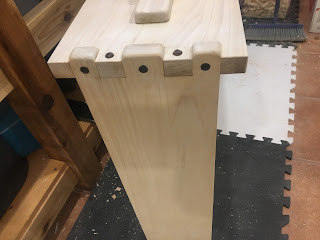 First preview of the dowels. 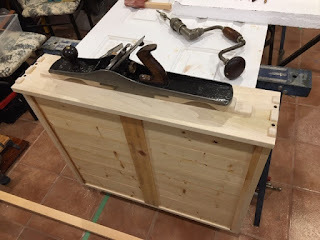 I am also using the same dowels on the two handles, but first I have to glue them in place. When the glue has dried, I bored holes to the drawer side tenons and added dowels. Dowels on the side too. I then bored the same size holes on each side of the handles and added the dowels. 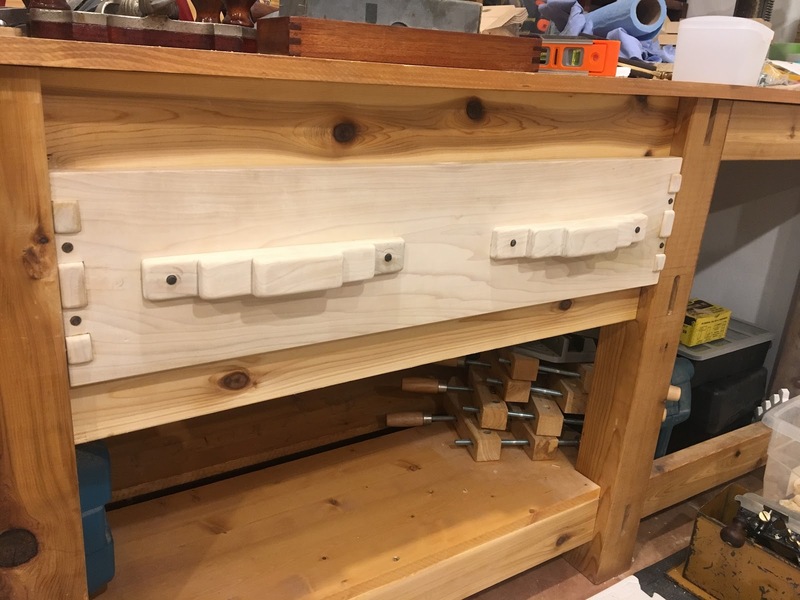 First handle with dowels fitted. 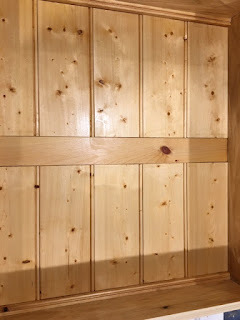 Here is some pictures of the final result. The drawer found its way to its final spot. 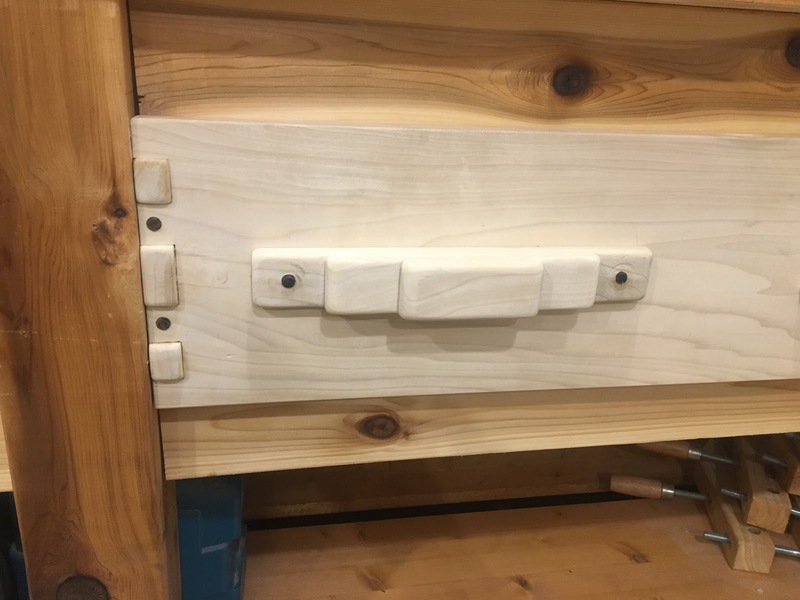 The drawer in its spot. Close up view for the pleasure to see it. Showing the side dowels for my satisfaction. 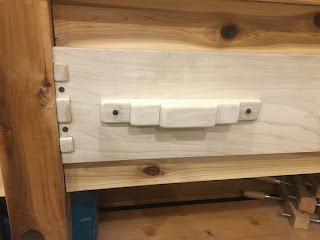 I am not really happy with the drawer handles. They look too bulky to my eyes. For the final finish I think I will use simple boiled linseed oil, not sure yet. Any advice on the finish? Well, that came out really nice. 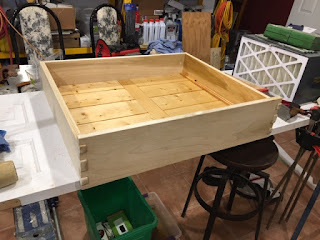 I'm more a fan of shellac or linseed oil finishes. But if you think the drawer will get hard use, then maybe something more durable like polyurethane would work. I love the way the bottom boards look. 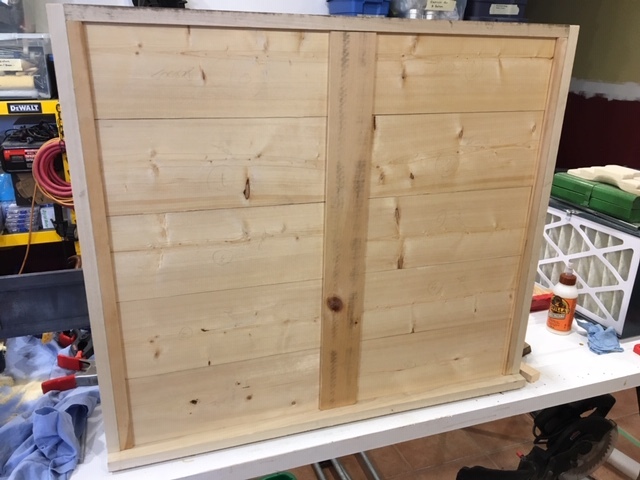 I meant to ask before - did you leave a little room between boards for expansion, or is the fact that they are separate boards enough? 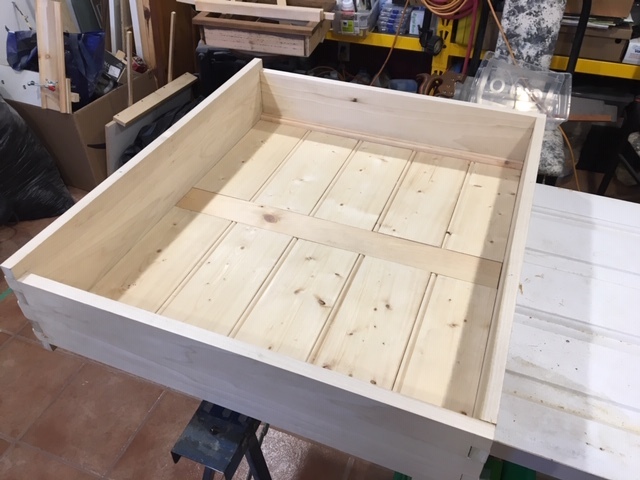 Matt, I am with you with linseed oil and shellac, I think this will be the right finish. On the bottom I left about 1/32 between each board and 1/16 around the boards in the drawer sliders, front, back and middle stringer. 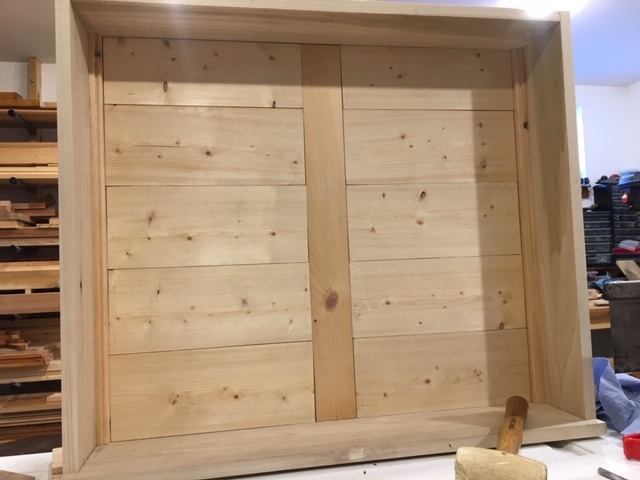 I am a bit worrying about wood move as here humidity is ranging from 40% during cold winter to +80% during hot summer so this is quite a big difference. This summer will be a god test!